cut-throat sessions of “Balderdash” and “Wizard”. Balancing our desire to enjoy the property and explore local wines mandated the choice of one high quality winery that personifies the diversity in the region, specializes in food-friendly wines and is located nearby. My choice was a no-brainer and, luckily, Longoria Wines and their quaint Los Olivos village tasting room were available and willing to host our group. My introduction to Richard Longoria Wines began through my passion for pinot noir, when years ago I first tasted his “Fe Ciega” Vineyard Pinot Noir from the Santa Rita Hills appellation. is located on the north side of the imposing Point Conception, above Santa Barbara, that forms the only east-west coastal mountain range in California. This natural feature and proximity to the Pacific Ocean make it ideal terroir for pinot noir. 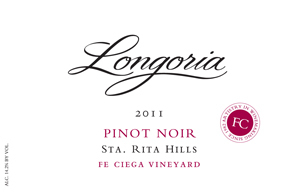 The 2011 Longoria Pinot Noir “Fe Ciega Vineyard”($48) embodies elegance from the very fruit-forward, spice-driven aromas through the velvety texture long on the palate. Oak plays a significant role in creating this wine, much of it new and thirsty. Its compatibility with salmon also makes the “Fe Ciega” a personal favorite and one can find it paired with fantastic dishes at local restaurants like Los Olivos Café and Sides Shoes and Hardware. 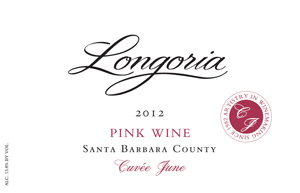 Longoria produces four additional pinot noir varietals including the accessible Longoria Pinot Noir “Lovely Rita” Santa Rita Hills ($32) and a single vineyard release from the famous Bien Nacido Vineyard. Richard Longoria has been a winemaker, mostly in this region, for forty years. After a brief stint at Buena Vista Winery, his passion for pinot noir and food-friendly wines led him to this area and the Firestone Winery where he met and later married his wife Diana, who handles business operations for Longoria Wines. Richard spent over a decade as winemaker at Gainey Winery near Solvang before starting his own small label in 1982, going full-time with the present winery in 1997. With an extensive resume, a very special vineyard and long-time friends in the region, Richard has set high standards for the wines that bear his name. The results have been fruitful as Longoria Wines consistently receive outstanding reviews in major periodicals. On this rainy morning, Diana Longoria and an associate were on-hand to carefully guide us through their story and their wines. best of each lot are carefully blended before bottling to meet Richard’s goal of fragrant aromas, good texture and complexity with the mineral elements of a classic Burgundian wine. This is my preferred chardonnay style, no stranger to oak with some butterscotch on the nose and enough acidity to pair well with seafood, and yes, more seafood. Longoria produces two additional “chards” including an exclusive from Rita’s Crown Vineyard. in a very nice food friendly rose’. Only 62 cases of this stainless steel fermented “pink wine” were produced making it in high demand. Longoria has been one of the few wineries in this region to diversify and experiment with Spanish varietals like tempranillo and albarino, both increasingly popular with consumers seeking alternatives to varietals. Their 2011 Longoria Tempranillo Santa Ynez Valley ($36), with small amounts of syrah and merlot and aged in 100% American oak, 45% new, has a nice spice on the nose and toasty rich fruit flavors with manageable tannins. The top tempranillo aficionado in our group gave it a “thumbs up.” The warmer climate and terroir of the Santa Ynez Valley seems to adapt well to the tempranillo profile and we can anticipate the planting of more vines. 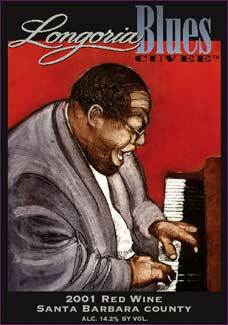 blues musician. Primarily a Bordeaux blend today, Richard originally created it as a single varietal Cabernet Franc, so ahead of its time that it preceded demand by California consumers and, hence restaurants. Needing to spark sales for this wine’s survival, he re-established it as a “Cabernet Franc/Red Table Wine. 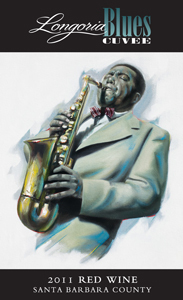 Later, Longoria’s love of blues music led to the artistic label that changes every two years and the wine that no one wanted suddenly became high in demand. Speaking of syrah, many Santa Ynez Valley vineyards like Clover Creek in the warm Happy Canyon appellation have become a friendly home for syrah grapes. It is without hesitation that I recommend the Longoria Syrah Clover Creek Vineyard 2011 ($28) as a fine localized representation of the varietal. 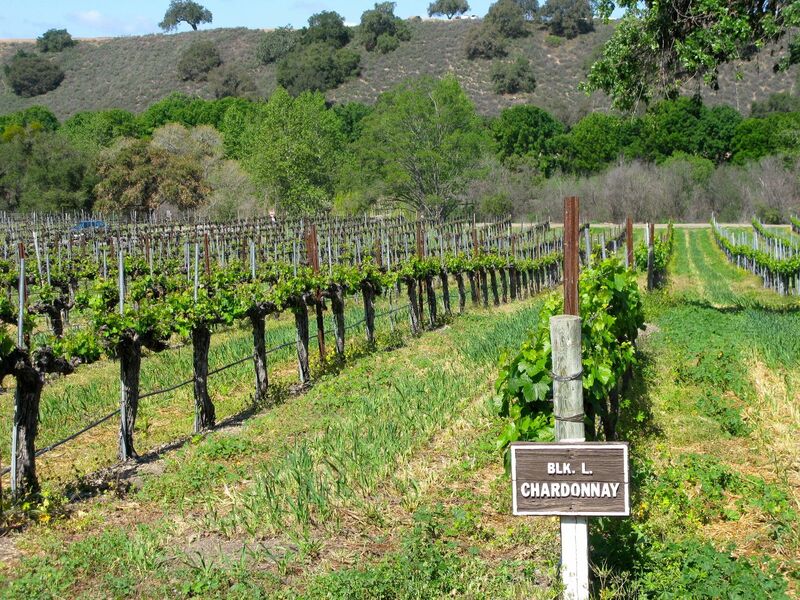 According to the winemaker, the vineyard is adjacent to the Santa Ynez River and has a cooling effect on the vines that seems to draw the fruit and berry flavors to the surface. We also made a note of the long and balanced finish with no hints of harshness. Once again, syrah was featured in what turned out to be a pleasant surprise of the tasting. 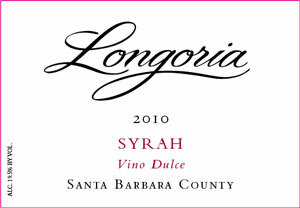 The 2010 Longoria ”Vino Dulce” Syrah Santa Barbara County ($23), a port-style fortified wine, expresses the same complexities as any Clover Creek Vineyard syrah, equal to, yet different. For me, the first test of any rich port-style wine is the bouquet. The “Vino Dulce” aromas of baked cherries and typical spices are clear, but then we are asked if we can sense the chocolate. One more sniff, nose in the glass and we say, “oh yes, definitely cherries and chocolate,” surrendering to the power of suggestion. with a piece of chocolate and we were treated to a nice long finish to the wine and the tasting. 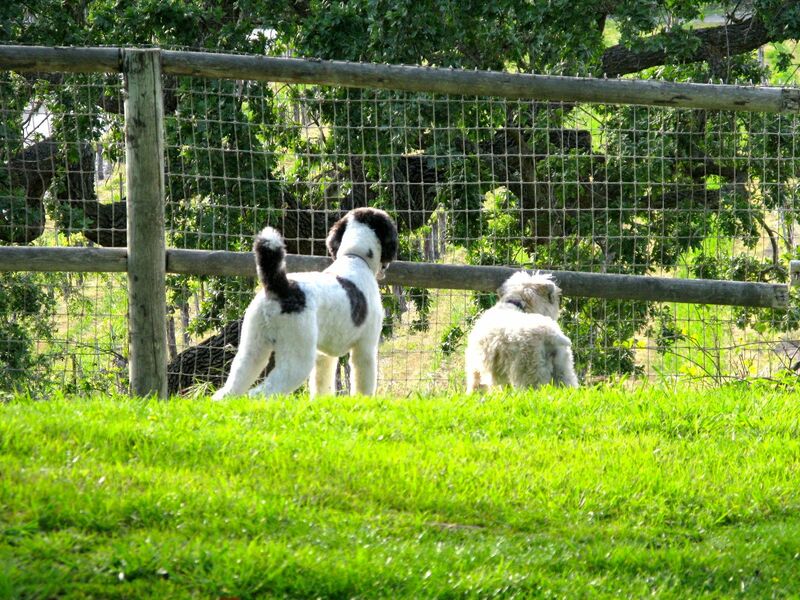 Our group, consisting of six adults, Mojo, a standard “party” poodle and Lotti, a soft-coated Wheaten terrior, found the large 3 BR/3BA, pet friendly Vineyard House at Koehler Winery to our liking. They also have smaller units available, all in a beautiful, vineyard setting. Los Olivos is an ideal place to relax and sampling a flight of Richard Longoria releasess is a great introduction to the diversity of a region that consistently creates wonderfully balanced, food-friendly wines. This entry was posted on Sunday, April 6th, 2014 at 3:12 am	and tagged with Koehler Winery, Longoria Wines, Richard Longoria, Richard Longoria Wines, santa rita hills, Santa Ynez Valley and posted in Wine. You can follow any responses to this entry through the RSS 2.0 feed.